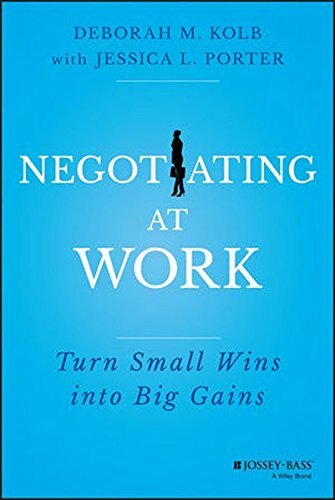 We asked Jessica L. Porter, co-author of the new book Negotiating at Work: Turn Small Wins Into Big Gains to share a few tips. Negotiating at Work focuses on what the authors call “lowercase-n negotiations,” or informal conversations we have in order to solve problems in our everyday lives. “If we think of negotiating as about solving problems, then it’s a lot easier to become a good negotiator, because we become aware of how we do that all the time,” Porter says. According to Porter, preparation comes in a couple of forms. Number one is getting good information. For example, if you want your boss to pay to send you to a conference, you need to know how much the conference costs, and also to consider whether your employer has paid for other people to attend conferences like it. “Think about how the conference might help you do your job better, and how it would help you give back to the organization, so that it’d be worth their investment,” Porter says. Think about the person you’ll be negotiating with. What is important to them? What’s their style? The more you know about your fellow negotiator, the more successfully you can communicate with them. Don’t let nerves hold you back. If you don’t ask for it, you’re not going to get it. But also remember to to be thoughtful, friendly and informed when you do so. Check your assumptions. It’s good to ask questions before the negotiation to be as prepared as possible, but you also want to ask questions during the actual negotiation. “In the negotiation itself, you want to be flexible in trying to learn as much as you can. It’s a difficult tension to hold, but it helps if you’re conscious of it,” Porter says. For example, think about a negotiation where you thought your boss’s top concern was one thing, but it became clear during the discussion that she was more concerned about something else. By paying attention in the moment, you may be able to use that information to help you come to an agreement. “It’s really easy to get focused on one issue. But when we get focused on one issue, almost always, someone loses. If we’re thinking only about a deadline, I either get an extension or I don’t. It becomes a yes or no question. Focusing on a single issue narrows the possibilities, and narrows the chance that everyone walks away feeling satisfied,” Porter says. She recommends looking for ways to, “expand the pie,” by adding extra topics to the discussion. “The more issues you introduce, the more opportunity there is to find creative solutions,” she says. Be willing to take a break. Porter says that taking a break can be as simple as saying, “let me run to the bathroom” or “this is really interesting and helpful. We may have reached an impasse, so what if we both sleep on it tonight, and let’s talk again in the morning.” Creating a break gives you a chance to collect your thoughts and bolster your confidence before you go back in – and gives the other person a chance to do the same thing. “It also helps to build trust, because it shows that you really want to work toward resolution,” Porter says.